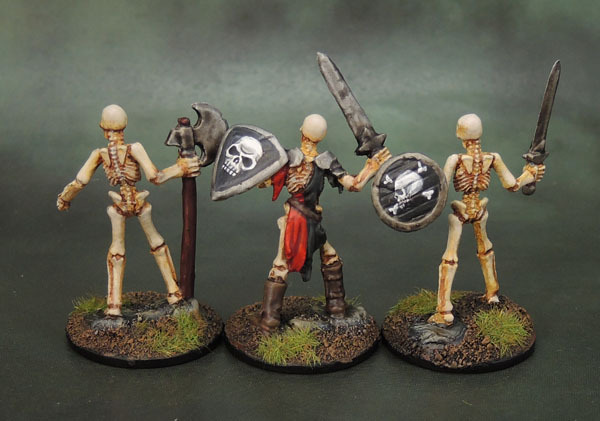 I’ve finished some more of my many Reaper Bones figures that fit under the rather broad undead umbrella that I use. No stretch this time, though, as they’re a bunch of skeletons. 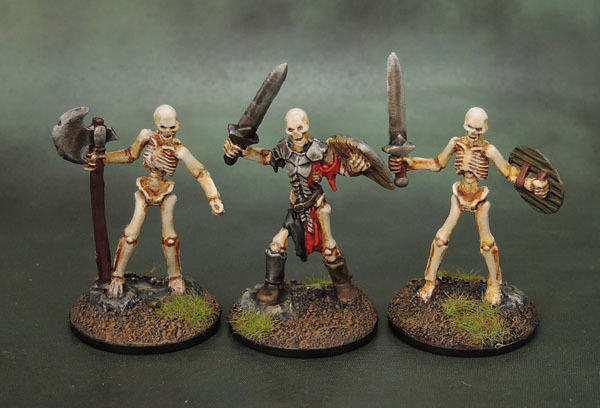 Originally sculpted by Bob Ridolfi, the Bones versions – somewhat predictably – suffer from mould lines, wobbly weapons and soft details. 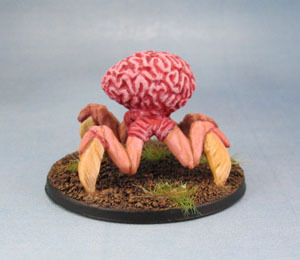 Still, they’re not the most terrible models and they’re good enough for RPGs or even standard troops on the table. 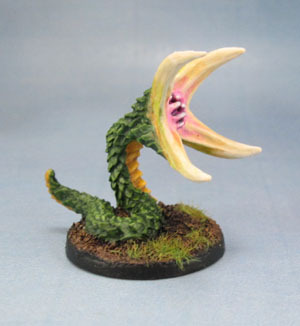 As usual, these guys were painted piecemeal over a period of time, mostly at work. They were a bit of an experiment – primed with the spray can and done in the normal manner, they were as sticky as all hell for awhile, but the acrylic paint over the top and the polyurethane spray seems to have settled it down. I skipped the decals on these guys because I didn’t want to “waste” 20-year-old decals on Bones models and instead did the shield designs freehand… and of course they came out far better than decals would have. They’re a pretty odd number to make a unit out of, with nine models. Bones II backers got one of each, while they’re now being sold in sets of three of each sculpts. I usually make a regiment from a dozen models, since they work out about right when based on 25mm rounds for the correct footprint of a KoW regiment. 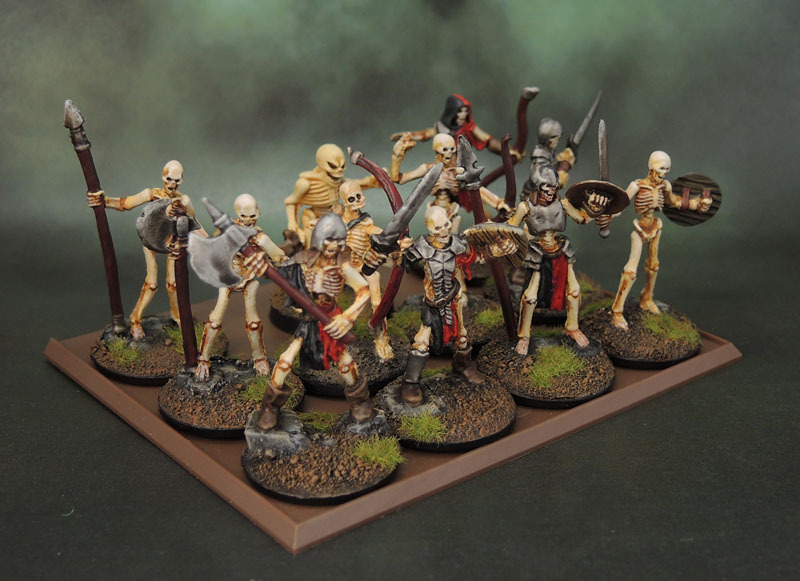 With nine models here, I’ll just shove the archers out of the front rank, and add a couple of random skeletons to make up the numbers. Turned out I could only find two, but good enough. 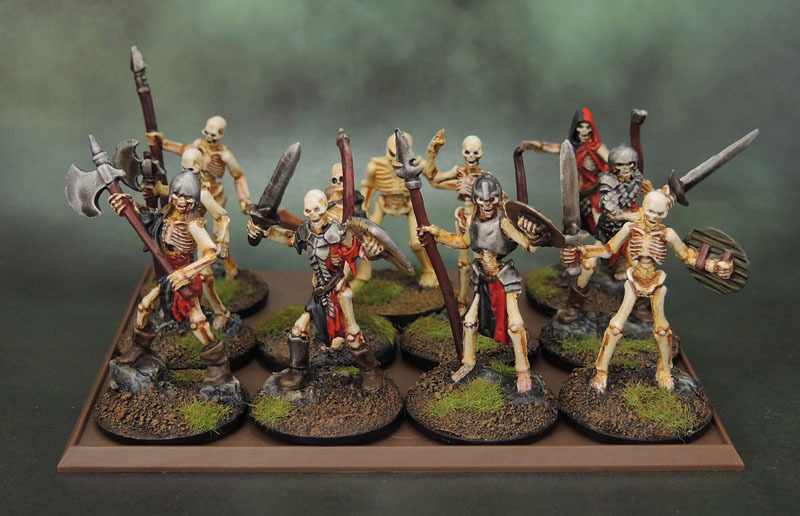 I’m calling it a done regiment, but if (when) I end up with more random skeletons down the line, I can split or remake these guys into 2-hander, sword and board or archer regiments. For the time being, it gives me a second Undead unit for September’s monthly Tale of Gamers challenge that I’m running on Dakka. 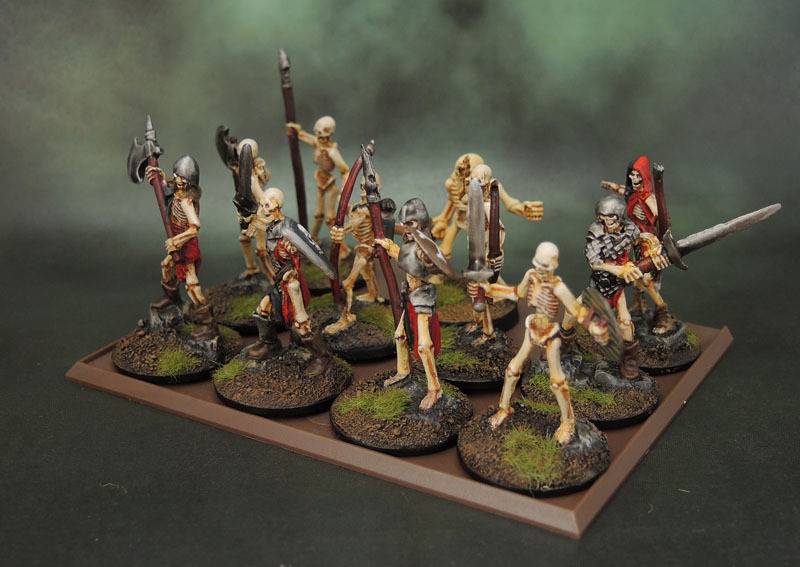 The unit is filled out with a couple of spare skeletons. 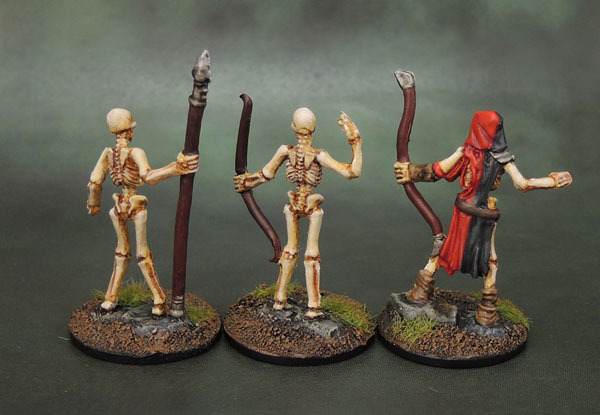 One (the archer) is from Bones 1, and the other is from Dark World, which I’ve mentioned previously. It only gives me 11 so I’ll have to sort out a 12th, but I’m still calling the unit functional for now. 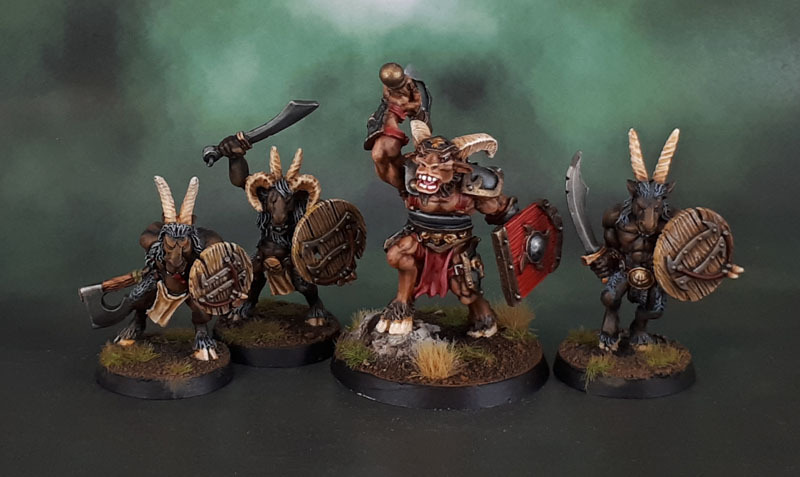 And finally, as is the norm – the completed unit shots. I wrote the following thoughts along with one of the first batches of Bones Skeletons I posted, and they’re just as relevant now, so hey. 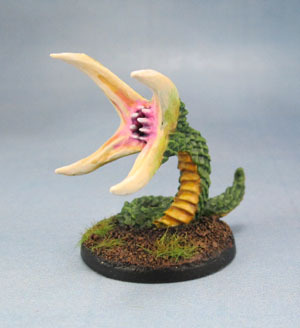 As models go, like many Bones, these do what they say on the tin, in a very basic manner. I’d really only recommend them for roleplayers. 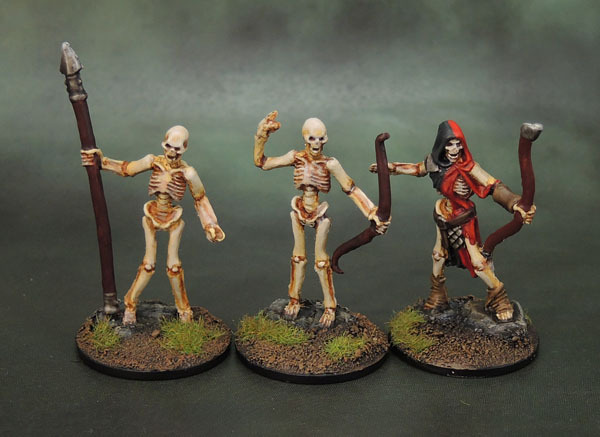 If you’re playing D&D and want some cheap and cheerful skellys for your adventures, then these are a perfectly serviceable way to go. 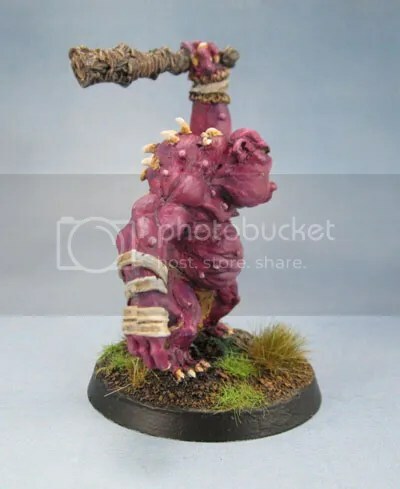 They even work okay if you’re the kind of roleplayer who never paints their models, or just gives them a wash to bring out the detail. For wargamers, there are many better options out there, especially for $2 each/$6 for three. 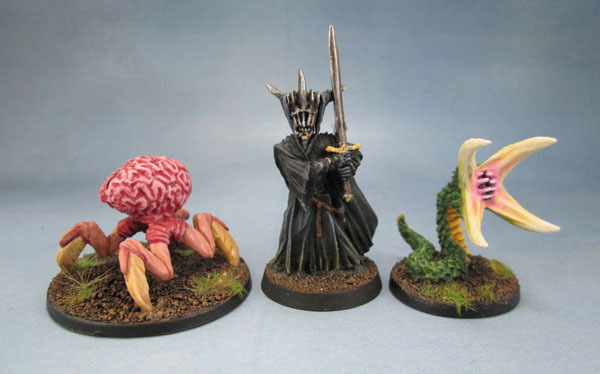 Still, I already owned these, they pass the three-foot test, and they’ve now gone from Unpainted to Painted, and we know that every time a miniature gets painted, a Kitten gets their Wings, so it’s all good. 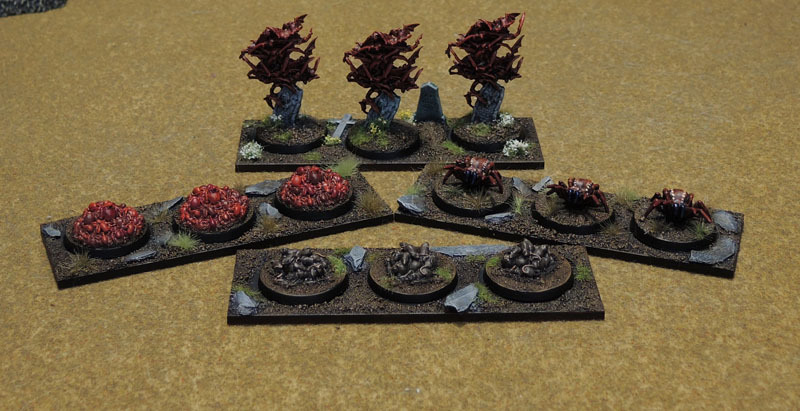 My rather pathetic entry for the Undead army part of the painting challenge in July was a single “swarm” unit that I’ve only photographed this morning – made up of a trio of Reaper Bones’ Bat Swarms (77046: Bat Swarm). (I can’t believe they want US$2.99 for them!) 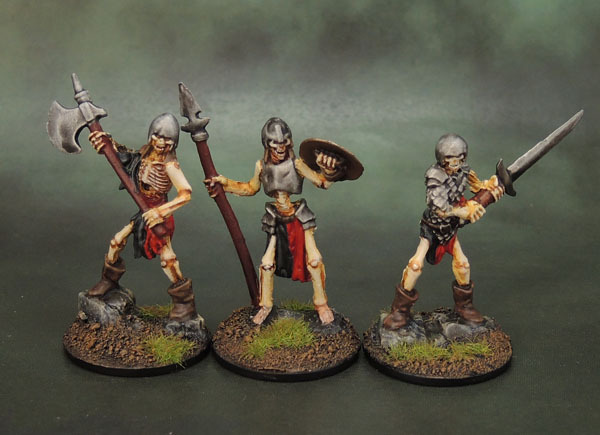 Since I have four of the models from their various Bones KS campaigns, I decided to paint the fourth at the same time in the same manner. The base coat was a mix of Reaper’s Master HD Colours of Rusty Red and Ruddy Brown. I then washed it with GW’s new Nuln Oil Gloss, to hit the recesses hard while staining the upper as little as possible. Then drybrushed with Khorne Red, Mephiston Red and finally Evil Sunz Scarlet. I’m well aware that these are tabletop quality paintjobs at best and that no-one will care how I did them, but the fact is they’re pretty crap models that don’t really deserve any better, and I’m simply recording how I painted them in case I get another pair of them to make a second swarm one day – purely for gaming purposes. I added the tombstones on the unit base from the Renedra Sprue since the bats were mounted on gravestones anyway in order to tie them in a little with their surroundings, even though I usually dislike “diorama bases” on my own models, as they place the models in too specific a location for figures that will be running around various tabletops. 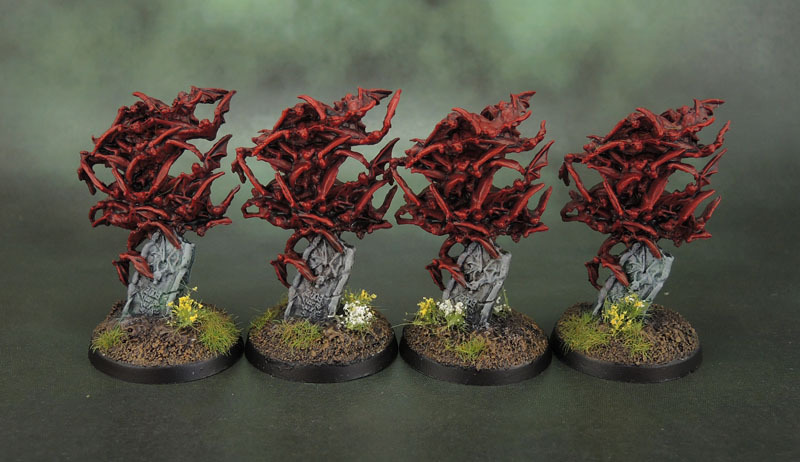 Cheetor at Sho3box did a much nicer job on his Bat Swarms a couple of years ago, which I noticed only recently via Google Image Search, what with highlighting their heads and whatnot, but for me, going reddish so they fit broadly within the Undead Army palette was good enough. 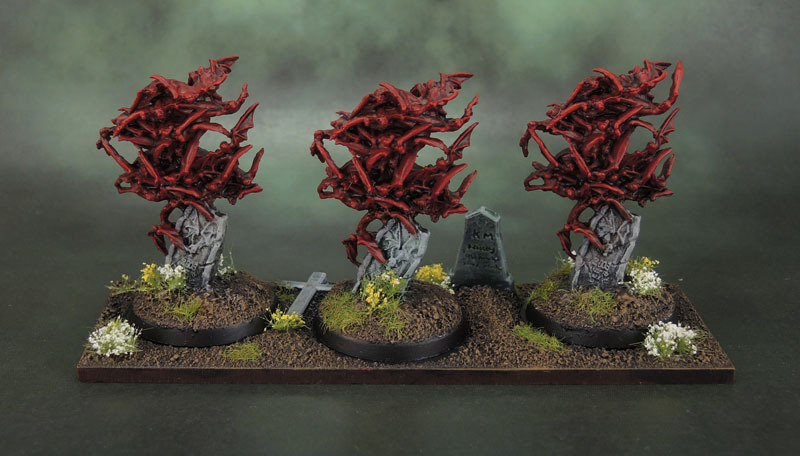 I also did their bases and unit base so they’d fit in with the Graveyard themed scenery that I’ve started putting together (very) slowly. Anyone actually excited by these? I thought not. The Rats follow almost the exact same ethos and purpose – though the models manage to be much less impressive. 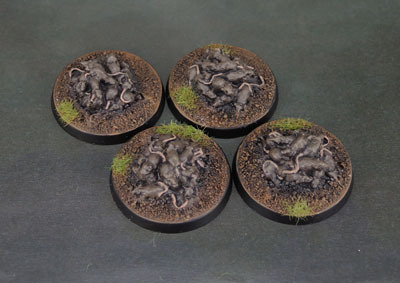 This time the models are provided by Reaper’s Rat Swarms (77129: Vermin: Rat Swarm (2)). You get a pair of them this time for your $2.49, though again I’d possibly be willing to argue their value, even for that price. 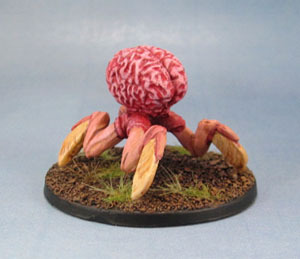 Anyway, once again I had four of the sculpt, and again I mounted them on 30mm round bases from Impact Miniatures, which I’d originally bought to rebase Space Marines but have been using to base various swarm-sized vermin from Reaper Bones so far. 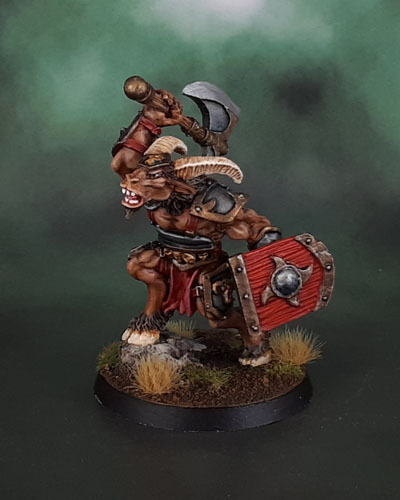 Paint was… various browns outside of my usual basing colours, including Model Air Khaki Brown at some point, again with the Nuln Oil Gloss, and then AP Tanned Flesh for their widdle teeny-tiny tails and feets. 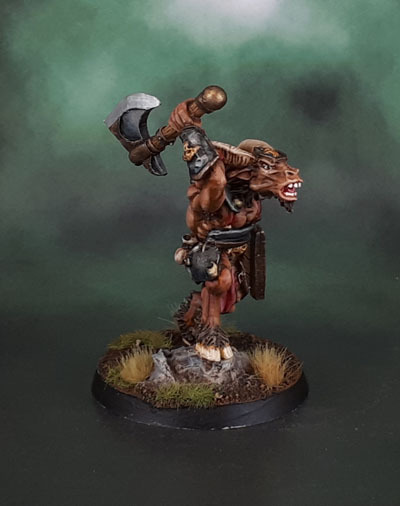 One day the rats will no doubt be shifted over to my Skaven Army, but I’ll need to actually have a few units of Skaven painted before that becomes a worry. I figure vermin like Rats fit in well enough with Bats and Bugs (Sol B shoutout!) to go with the Undead in the meantime. 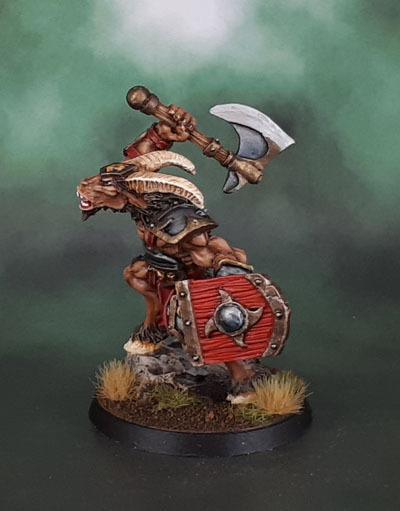 As I finished the the Rat Swarm base in early August, it will also be my weaksauce minimum mandatory Undead submission for this month’s paint challenge if I don’t manage to get something more impressive done. 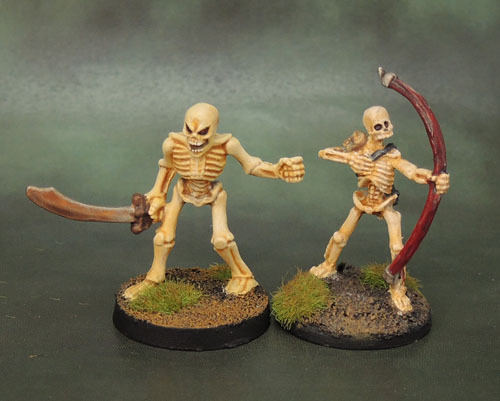 And yes, I’m aware that these Bones models started as metal sculpts in greater detail (and multipart for the bats) and the Bones stuff is cheap & cheerful stuff for gamers of various stripes. 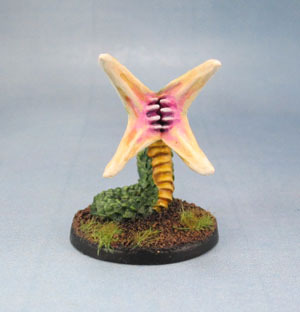 That’s why I painted them, though it doesn’t preclude me from pointing out that they’re both a bit rubbish, even if they end up looking passable on the tabletop. Including the fourth, warped Bat Swarm (and yes, I did the hot water, and yes, it bent back anyway). These have a secondary, theoretical use for me in RPGs. 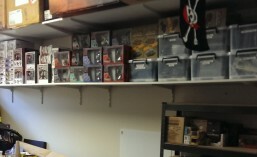 And the Skaven army. 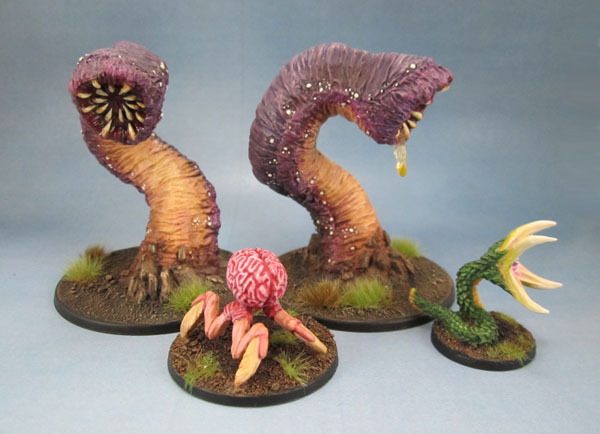 Swarms for Kings of War – models by Reaper Bones. Something a bit different from the norm again today. 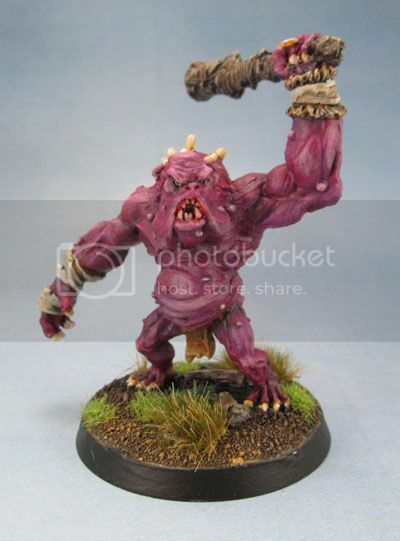 A few years ago now there was a time before Zombicide and Borderlands 2 when my gaming group spent quite a few evenings playing through those D&D Boargames. 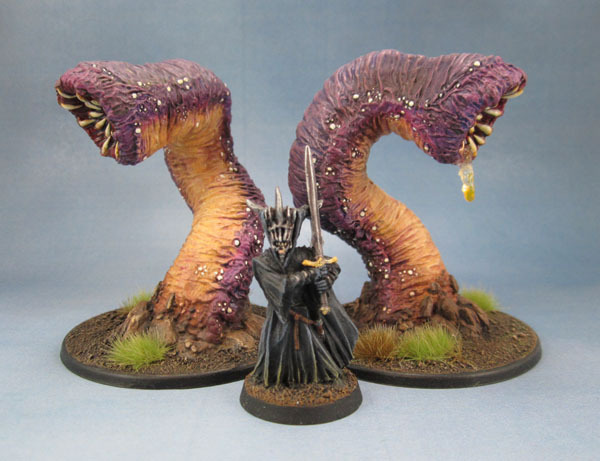 I’ve shown off the odd critter from Ravenloft and Ashardalon here before, but this guy is from the other side. 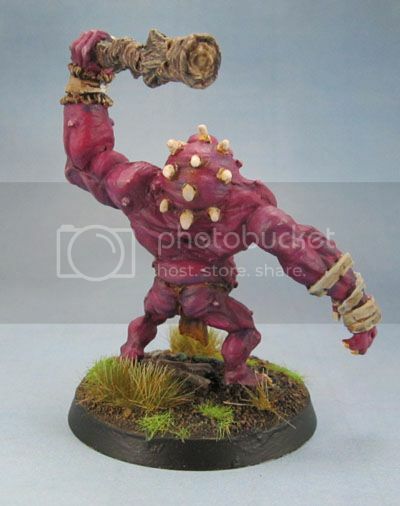 A model purchased to represent one of the player characters. 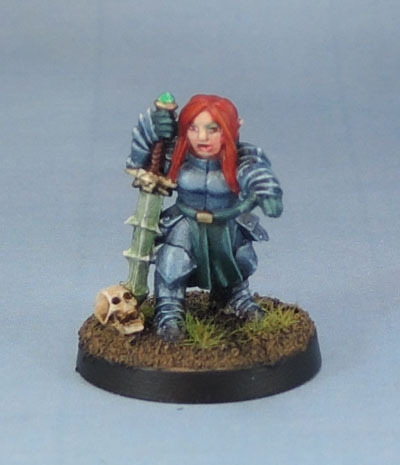 I actually created a huge list of (mostly) Reaper Miniatures to better represent the player characters as I was never particularly enamoured of the PC models that came in the boxes. 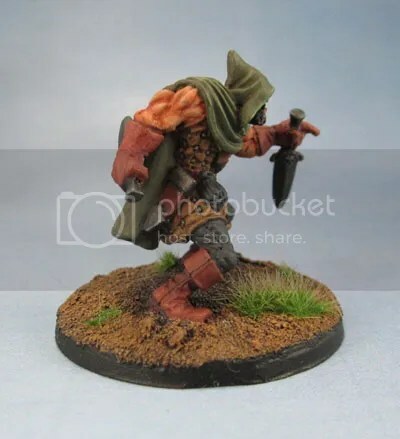 One such character was the Half-Orc Thief. 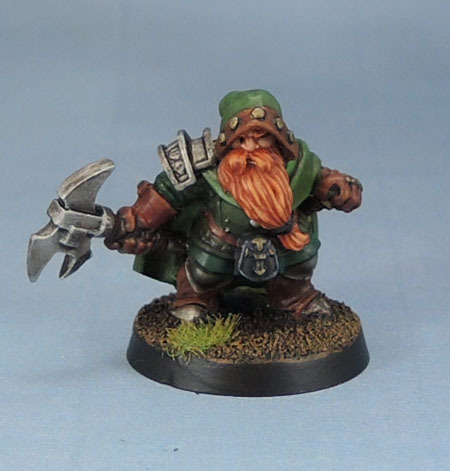 Needing one of those, I browsed the Reaper online catalogue and saw this guy, a lovely Tre’ Manor sculpt. Shortly afterwards, he was mine. Since I’m no fan of broccoli bases, I had to base him on something plastic and round. 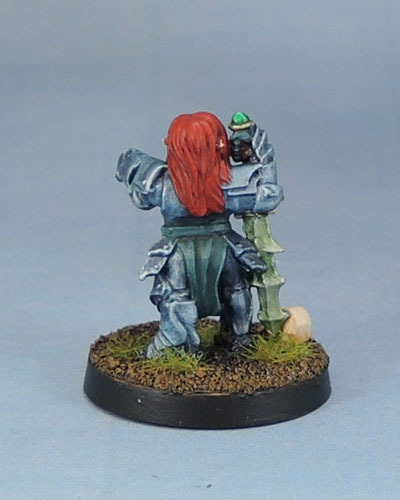 A Proxie models 40mm round base was the best and most appropriate thing I had, if a little large, but with his stature and wide-legged stance, this was the smallest thing I could fit him on. The most important thing was to work out a palette that worked for a rogue, was somewhat realistic (for a fantasy trope) and wasn’t completely boring. That means an all-black outfit was out. 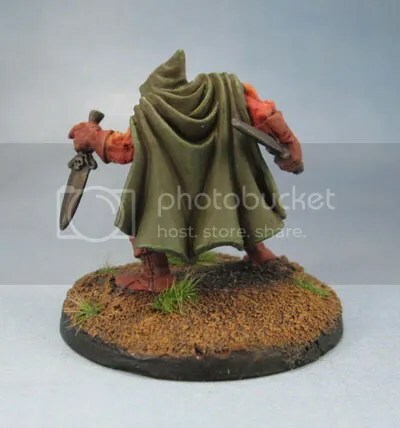 It might be the “obvious” go-to for a rogue or thief in some ways, but I also thought it’s the sort of thing that’s very likely to attract lots of attention if he were to be walking down a street or sitting in a tavern. Kinda like a sign saying “YES I AM A THIEF”, or a guy in a ninja outfit sitting in your local Starbucks. So I wanted to use some colours. 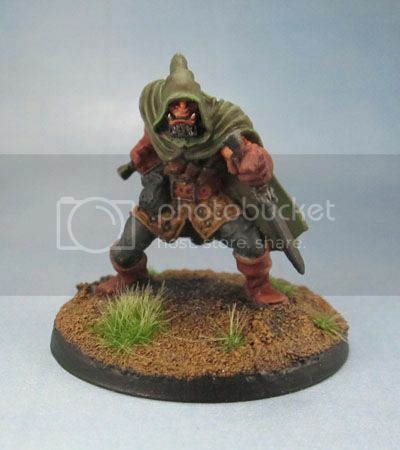 Secondly, this guy is a Half-Orc, not a weedy Elf, so I wanted to go for muted, natural colours instead of rich, opulent colours. The result was dark grey leggings, a brown leather padded jerkin, and for a spot colour, red-brown gloves and boots. 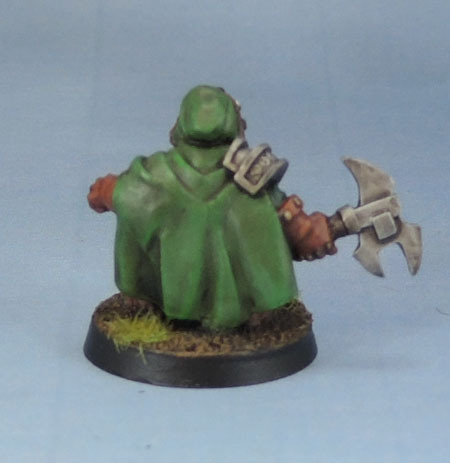 Pouches in dark grey again, and a natural woodland green for his cloak. The sort of thing that would be dark and dull enough to provide some camouflage in a town or out in the bush. His dual-wielded daggers are painted in the Vallejo colour called “Metal Black” (Or Black Metal!) – which is a really dark, true gunmetal colour. 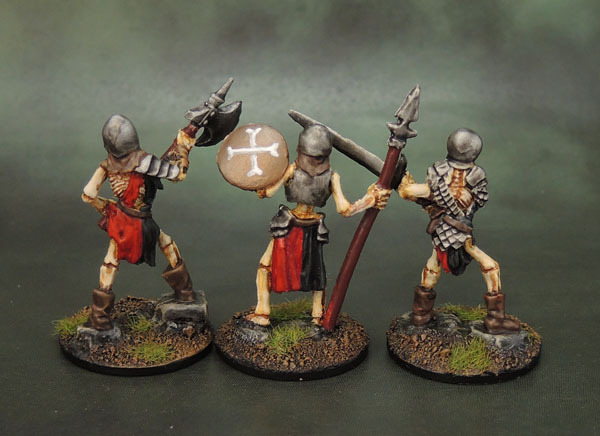 No shine, no highlight, no picking out the pommel or crossguard in bronze, or painting the little skulls on them in bone or gold or whatever. They’re bloody rogue’s daggers! 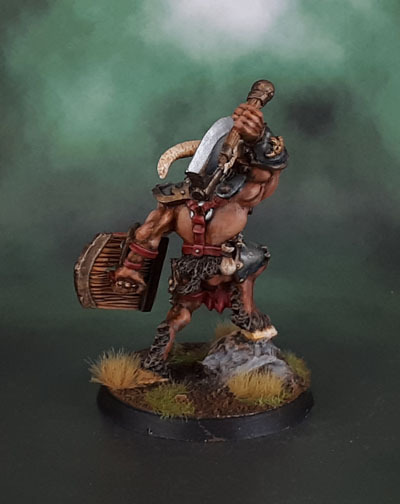 Anyway, this guy – like so many other figures – sat half-painted and mostly forgotten for a couple of years before I chose him a couple of weeks ago to get done and dusted. Within a day, he was finished. Since we’re not playing the D&D games at the moment and haven’t played Pathfinder in a year or more, now he goes into a glass cabinet until needed at some point in the future. At least he’s done, though!